STREAM ACCESS - PASSING ? .. HB 190 passed the house by an overwhelming majority vote: 95 - 5. This is the bill that prevents capricious and arbitrary fencing off stream access; particularly at bridge crossings. Read about it at the Bozeman Daily Chronicle. Note that the Bozeman contingent opposes the bill. .. 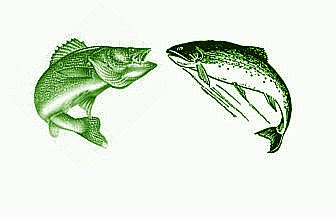 This story was cited by Protect Your Waters as: "Walleye vs. Trout Playing Out in Montana Legislature." .. We'll have more to say as the legislative session progresses. Let's hope that there are sage and cogent minds in the conversations as the battles heat up. 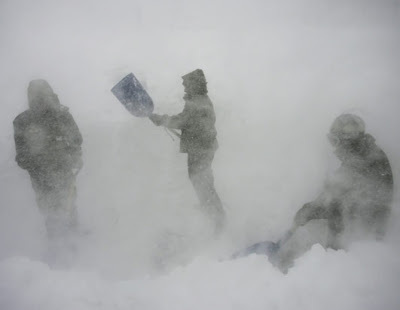 .. Our own special advisory continues until about noon. A WINTER WEATHER ADVISORY REMAINS IN EFFECT UNTIL 11 AM MST THIS MORNING FOR SOUTHERN PORTIONS OF GALLATIN COUNTY INCLUDING THE WEST YELLOWSTONE AREA. SNOW WILL CONTINUE ACROSS SOUTHERN PORTIONS OF GALLATIN COUNTY THIS MORNING. 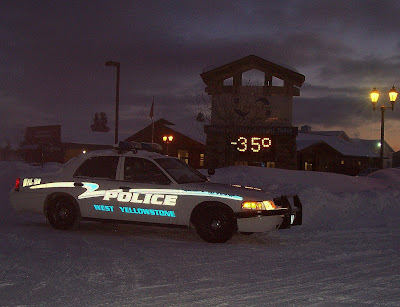 LOWER ELEVATIONS...INCLUDING THE TOWN OF WEST YELLOWSTONE...ARE EXPECTED TO RECEIVE 2 TO 5 INCHES OF SNOW ACCUMULATION...WHILE THE SURROUNDING MOUNTAINS COULD RECEIVE 6 TO 12 INCHES OF NEW SNOW. .. It's just 41 degrees below zero and the false dawn is cracking a bit over the Madison River Notch in Yellowstone National Park. Another beautiful day in paradise. .. The origin of the "Brass Monkey" phrase is speculative and attributed variously to vulgar usage, brass cannons, and tourism trinkets bought in the Orient. 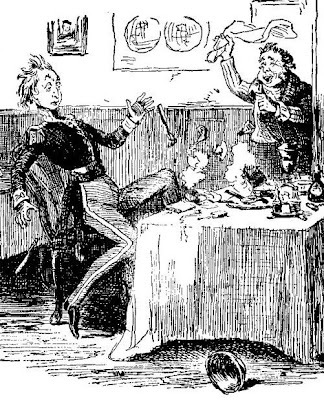 .. Another, most commonly offered, theory is that it's a nautical term and refers to a brass ring or tray on a "Man O' War" that held stacked up cannon balls. 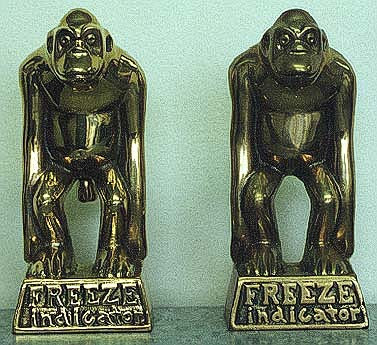 When the temperature dropped below freezing the metal "monkey"contracted and the cannon balls rolled off, hence freeze the balls off a brass monkey. .. A commonly suggested origin is that the familiar pawn broker emblem was originally made of brass, and called a monkey. .. See Wikipedia for a discussion of these and other theories of origin. 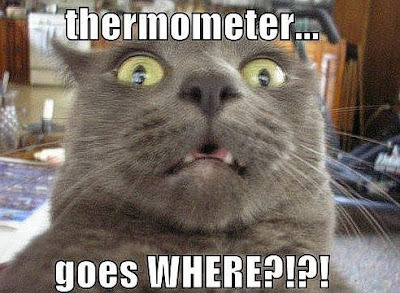 .. What ever the case may be - it got a bit nippy last night and we'll be lucky to see 5 degrees above zero by noon today. Sweater weather, as the neighbors say. 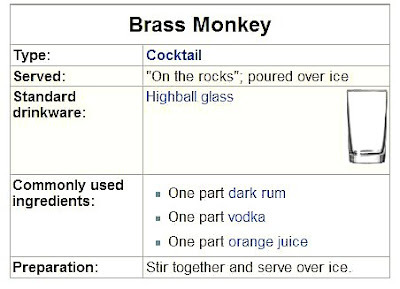 .. Should you care to indulge yourself there is also a fine libation called the brass monkey. .. Time for the morning cholesterol fix: biscuits and gravy, flapjacks with butter, a bear claw or two, and some day-old donuts with buttermilk, washed down with yesterday's reheated coffee. HOW'S YOUR BILL DOING ? .. We're watching to see if the walleye becomes a native fish through legislative action and if tips count as wages. The IRS wants you to know. how's your table service ? 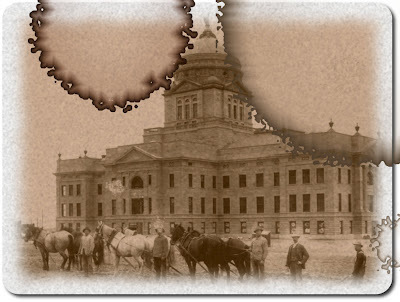 .. Sidney is a pleasant community just 4.6 miles from the North Dakota border. It's on the banks of the Yellowstone River and most of it's news and activities make the papers in Fargo, and Minot, North Dakota. .. 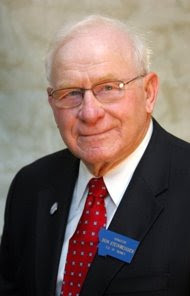 Senator Steinbeisser, is chairman of the Senate Agriculture, Livestock and Irrigation committee, and a member of the Business, Labor, and Economic Affairs - & - Natural Resources committees. Although he does not fish, he believes that SB-15 will go a long way toward "correcting" the view that trout are the only fish in Montana. 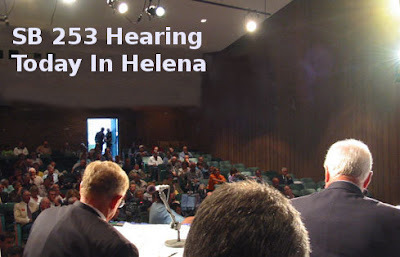 .. His sponsorship of a bill that would deify an invasive species as a native species, and update scientific names is just what could be expected from someone that does not fish, and one who thinks that it's the legislature's place to correct science. [[ Shades of the Butler Act and the Scopes Trial.]] - - - Is there a family resemblance? .. This gentleman is also the sponsor of a bill, (SB-253,) [[Story in Great Falls tribune,]] that would allow an employer a tip credit to meet the minimum wage for tipped employees. .. 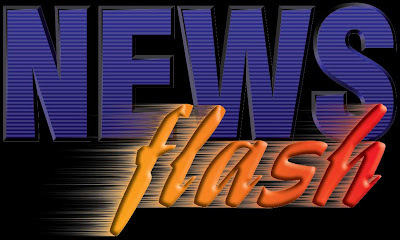 Although the bill is aimed at cutting wages of restaurant staff to somewhere in the $2.50/hr. range (capped at $6.90/hr. and adjusted for tips.) This will have far reaching consequences in all parts of Montana's service centered economy. .. The bill would allow employers to 'count' tips as wages and reduce salaries accordingly. It also includes provisions to 'update' the reductions on an annual basis. .. Pause, for just a moment, and consider the results of this mentality on the service sector of the economy in service-centered Montana. .. Tourism is a giant chunk of our economy. 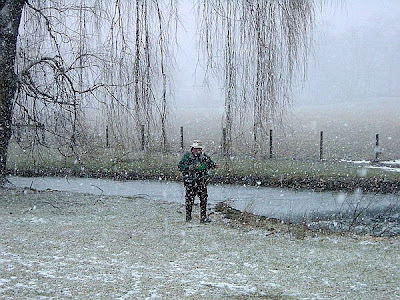 The workers are restaurant staff, pub staff, fishing guides, hunting guides, tour guides, hotel staff, and everyone that strives to make visiting Montana a memorable experience. .. The IRS is going to have a field day with this one. Stingy business owners are going to drive away competent help. Why would any competent and thinking service worker bother to excel if the fruit of their efforts just went into their "owner's" pocket instead of their own? .. 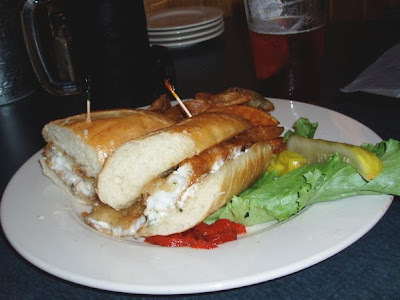 If your walleye sandwich falls on the floor between the kitchen and your table, it's going to be picked up and presented just as carelessly as if it didn't fall under the 10-second rule. 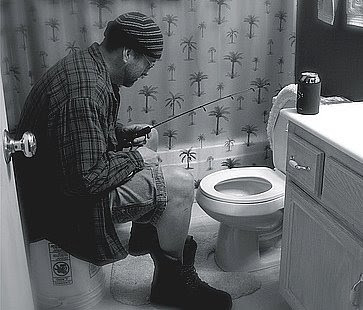 .. And, if the fishing guides of Montana have to kick-back their tips to the proprietors of feather bins and hackle racks, you might just as well stay home and fish in the toilet. .. We're going to follow SB-15 and SB-253. 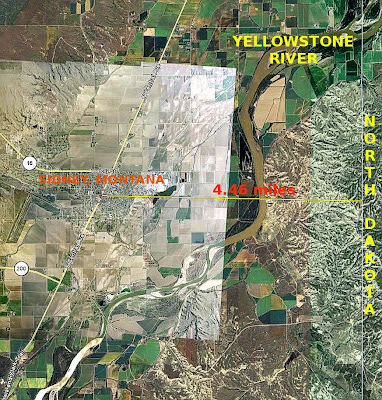 Maybe there will even be a bill to extend the borders of North Dakota just 5 miles to the west. We'd vote for that. .. "UPDATING SCIENTIFIC NAMES ???? ?," is this the job of our state legislature???? just what is a local ? .. Everyone wants to be a local. Move to Montana, splash around a bunch of money, fence off your stream, build a castle with a 10-car garage and stock it with everything but a pick-um-up, and call yourself a local. .. And now, there is a bill before our State Legislature to deny science and call the walleye a local. This is akin to making rock snot the state mascot. .. Bless our legislature. They couldn't even pass a bill that affirmed state law, and now they are revisiting the insanity of defining what is a native fish. .. The AP reports (via: Trout Underground) that Bob Gilbert, executive director and lobbyist for Walleyes Unlimited of Montana is busy pushing the bill. 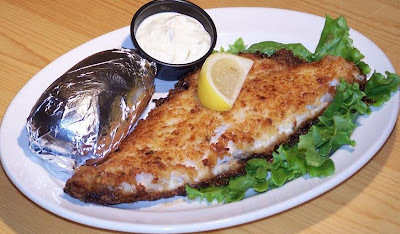 The walleye organization influenced the bill and will feed legislators fried walleye the night before Thursday's [[ tomorrow's]] hearing. .. Let's not demean the fish! They're good in a sandwich and very good breaded and fried. But so is an oyster. So is chicken. So, too, is eggplant. So what? .. If our legislature sells out for a chunk of fried fish you can bet that there will soon be public access to artificial impoundments only! .. 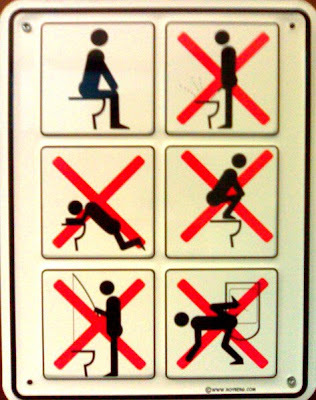 The mind boggles at the possibilities. What will they stoop to next? .. Would they sell their sister for a meatball sandwich? We wonder what we could get for a 7-course dinner of Soy-Au-Gratin? With all the trimmings of course. .. Let's concentrate on our real locals. Lets help the Cutts that are being hybridized out of existence. Let's cherish the Grayling. Let's adore the Bull Trout. .. Let's get a grip and concentrate on the locals. Good grief Mable, let's not add fuel to the conflagration that is destroying fish and fish habitat at an alarming rate for an invasive perch. .. Maybe the blessed law makers would consider a new flag as well. We'd vote for a $60,000 exotic S.U.V. as the new state new emblem. But rumors abound that there is already a design on the drawing board. We hope not. .. We're going to have a sandwich. It's free, and it's in Helena. .. He was plagued with "wrong-time-ism." A bit of representation in a world of abstraction. This made him a target of critics and a hero to everyman and college rebels. How dare he paint what he saw? It now seems a grand joke! Blessings be upon his soul. 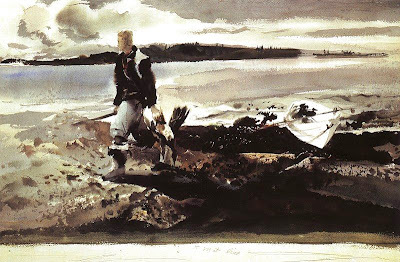 .. Maybe it's always dreary in New England, maybe not, but Wyeth captured the light of the best fishing days. .. The bugs know this, the fish know this, the neighbours know this; only the people who make calendars and illustrate fishing books ignore this. .. It's a simple equation: dreary day=fishy day. We mentioned this just last October and summoned "Christina's World" to illustrate the point. 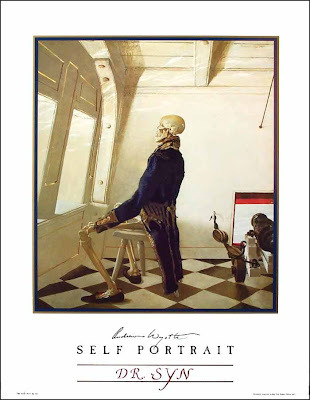 .. We remember Andy, Helga, Walt, Ben, Karl, and the paintings that capture the light. 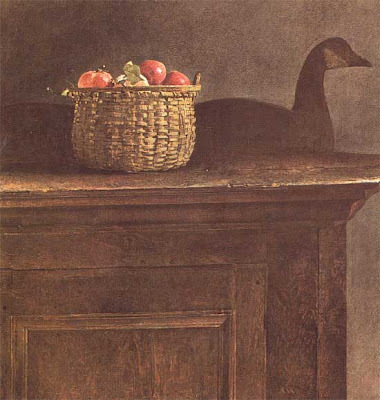 .. Be it a bedroom, a coot hunter, or a lobsterman's dory the signature style is distinctive - even the critics admit it. 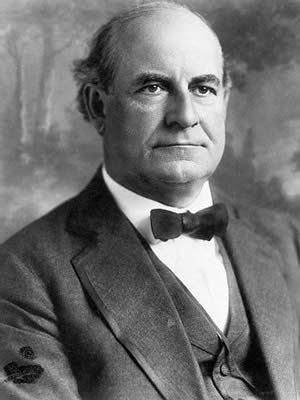 The mature style developed right after his father's death and was persistent over 50 years. .. 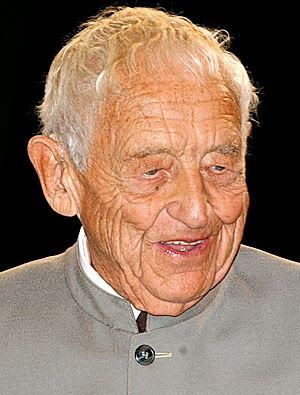 The New York Times, Los Angeles Times, and Smithsonian Magazine have notes about his passing. 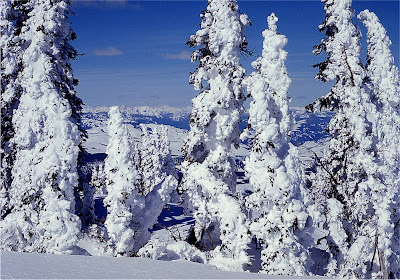 Less eloquent but more fun is a piece about his granddaughter's insights in The Seattle Times a couple of year's back. 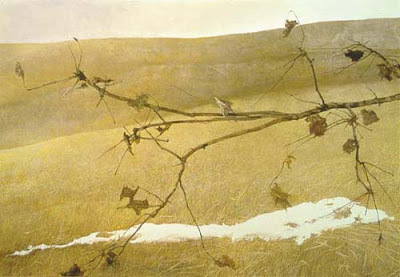 .. We're not nearly so eloquent or impassioned, however, Wyeth's pictures are a delight: need we say it - speak for themselves. .. 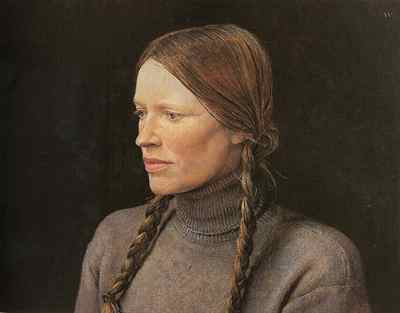 If you happen to be a Wyeth aficionado the subjects become intimate friends, protagonists, neighbours, and characters. The places become as familiar as your own kitchen. You can become fascinated with the ordinary. .. Helga fascinated us, along with the rest of the country, in the 80's. Did painters still paint nudes? Did they do it in secret? What went on? 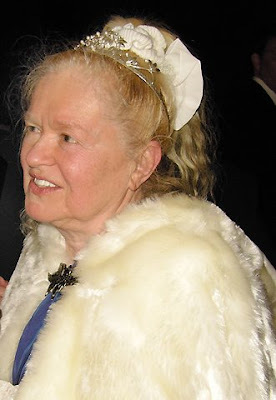 Prurient interests fueled a sort of Helga mania. The critics loved it. Scholars doted on it. .. The neighbours winked and acknowledged that painters were people too. It was fun. We caught fish and called them Helga. .. We are still in a world that loves the abstract. The best fishing place, the best fly, the best fighting fish, the most spectacular venue, the most exotic trip, the finest wine, the rod with best action, are all abstractions employed to enhance a fictive experience of the mind. 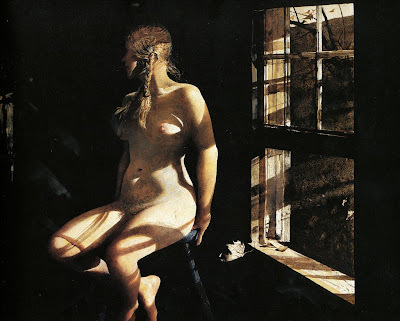 .. Wyeth celebrated the mundane. He reminded us of the day-to-day world. No escapism, no meaning in blotches and swirls, no denial of what was just next door and around the corner: just the mundane - Hallelujah! .. The top of a chest, the landscape outside the window, the house next door, a neighbour, an old car, a baker and caregiver, all are available to the rest of us. No "BEST" just the rest. .. We can associate with this. Our fish are mundane, normal, accessible, and next door. Our tackle is pedestrian and utilitarian, some of it older than we are: it works. It's familiar and friendly and has seen many days when a calendar photographer would stay home. .. We don't idolize our gear, we see no exaltation in a pleasurable pastime, and we acknowledge that our sport represents a pleasant and rather mundane bit of the universe. But we enjoy it. .. The spirituality of the mundane is too often overlooked. The vibrancy of the neighbourhood is reduced to oblivion by the promise of adventure, in exotic and unvisited places. We always seem to forget that there's no place like home. .. 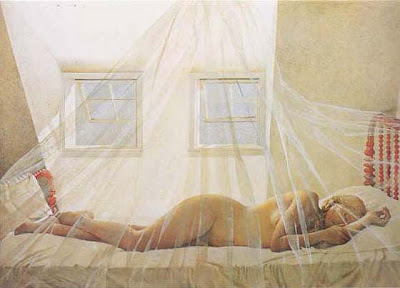 The emotionalism, spiritualism, and abstractions evoked by some critics and Wyeth himself is cerebral. .. It's a meaning of the moment, and requires more than the viewing of the images. It requires that you know about Christina or Helga, or Walt. 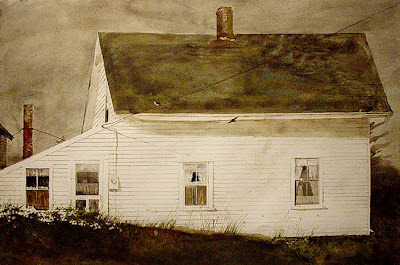 It requires that the viewer enter the neighbourhood and become familiar with Wyeth's home. .. It requires that you evoke the time and place that is . . . Here & Now. 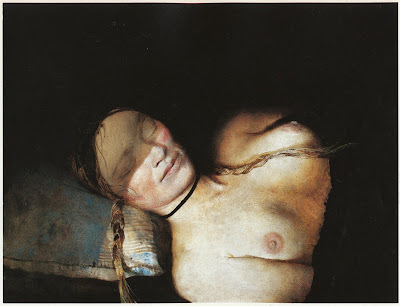 A snapshot is just that, and Wyeth's are evocative. A history is written in a home; yours, ours, and his. 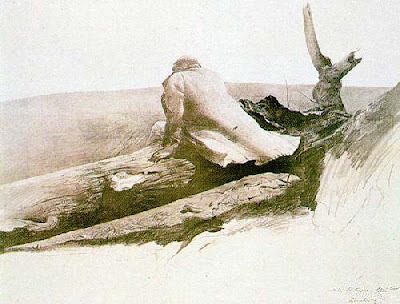 .. Wyeth enjoyed his home. He enjoyed his neighbours and neighbourhood and let us see it - warts and all. .. The formal announcement of this action oriented working group can be found at Protect Your Waters. We salute the concern and selfless efforts of all involved. Here's the full text. . . . . The Greater Yellowstone Area (GYA) is a global asset that is treasured for its natural beauty, geological wonders, biological diversity and plethora of recreational opportunities. People from all over the world visit the GYA to enjoy its natural wonders and resources. The GYA is the headwaters for three major river systems that are of immeasurable economic importance to the United States. The unique ecological and economic values of the GYA are now being threatened by aquatic invaders, or aquatic nuisance species (ANS). These non-native mussels, plants, snails, and other introduced species have the potential to severely impact the region’s ecosystem, tourism, agriculture, hydropower, and businesses. 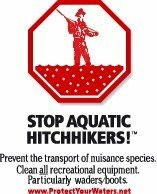 • Prevent new introductions of ANS into waters of the GYA. 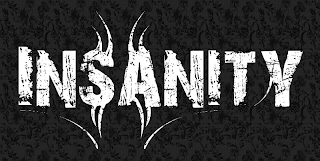 • Limit the spread of established populations of ANS into uninfested waters. • Abate harmful ecological, socioeconomic and public health and safety impacts resulting from infestations of ANS within the GYA. • Provide a cooperative environment that encourages coordinated activities among all interested parties throughout the GYA. Key action items include survey, research, outreach/education, and control. Surveying for ANS in and around the GYA will provide essential insight into existing conditions. This element of the implementation plan is currently under-funded and the group is seeking funds to accomplish it with a GYA-wide approach. ANS pose an immediate threat to the waters of the GYA. All those involved recognize that everyone who lives, works, or plays in the GYA needs to work cooperatively to prevent the spread of ANS. 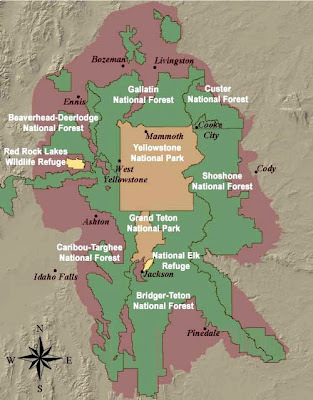 For more information on how to get involved to protect the GYA from ANS, please contact the Chair of the GYA-Wide ANS Working Group, James Capurso (Caribou-Targhee National Forest) at 208-557-5780. What Would Woody Say ?